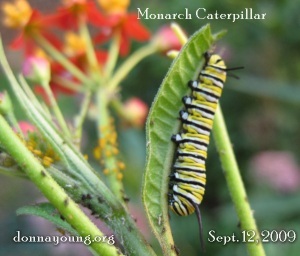 During 2009, several monarch butterflies emerged in and just beyond my garden. 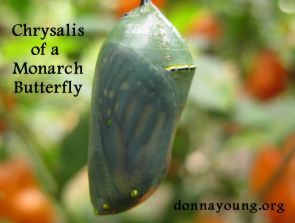 The butterflies were there because of the milkweed that was growing in my garden. 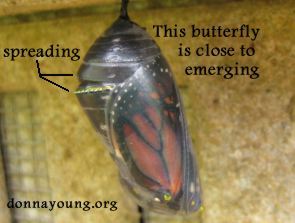 The two photographs above show monarch butterfly chrysalises at two different stages of development - halfway done and pretty much done (I do not know the scientific terms for that, if there are any). 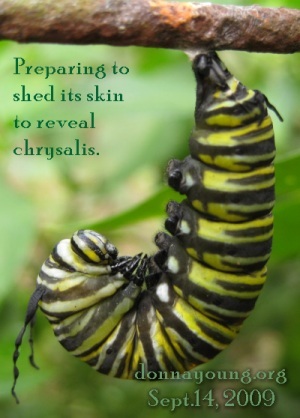 The one pictured on the right was taken just hours before the butterfly emerged. 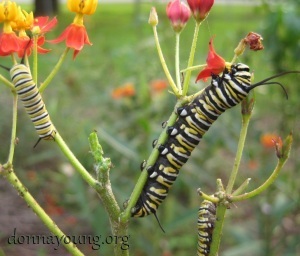 The caterpillars traveled a short way from the feeding area, the milkweed plants, to find a place to undergo their metamorphosis. 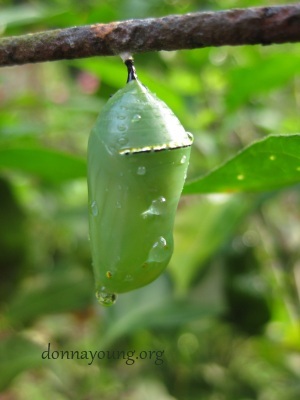 One attached itself to a sage plant branch, a few others attached themselves to the back of my house, one attached itself to the underside of a wash tub, and (pictured below) several caterpillars attached themselves to my tomato cages which were, at the time, being used for habanero peppers.